11736 Elk Heights Lane SE: 5 Acres, Gated Community, Beautiful Home! The typical retirement dream involves riding off into the Sun Belt, golf clubs and beach umbrella in hand. However, the reality is that the majority of retirees never leave home. Most people opt to age in place, or if they do move, they find a smaller house near their old neighborhood. Only about 7 percent of older Americans move every year, according to a long-term study by the Center for Retirement Research at Boston College. And even though more people have been relocating recently with the improving economy, an AARP survey found that most people approaching retirement hope to remain in their current residence as long as they can. Home is where the heart is. Many people feel attached to their home towns. Whether they grew up there or moved there to raise a family, they still enjoy going to the park where they took their kids as toddlers. They feel comfortable knowing about the best hardware store and the best pizza place. Many old-line suburbs have developed programs and amenities for their older population. Another benefit: Urban centers in the Northeast provide better public transportation than the retirement meccas of the Sun Belt. There’s no subway in San Diego and no ‘T’ in Tampa. People retire in the last place they land. Some people never settle down to live in one place for 20 or 30 years to raise their kids in a single community. Many baby boomers have moved around for work, or just because they’re restless, and then finally put down roots when they’re in their 40s or 50s. For example, my sister-in-law grew up in New Jersey, then moved to Michigan, Texas and finally in her late 40s settled down in Pennsylvania. She’s adamant that she’s not moving again. Visit a virtual village. Virtual retirement villages can help seniors access resources to make it easier to age in place. A virtual village is a local non-profit organization that posts information online, providing referrals to member-recommended service companies and volunteers available to help out with dog walking, yard work and other homeowner needs. Some villages host social activities such as concerts, restaurant gatherings and group trips. Check out Village to Village Network at vtvnetwork.org to find more information on what villages do and how they work. There can be great joy in moving into your first apartment or your first home. You finally have space all to yourself. You can decorate how you want. You can spend your time how you want. Sadly, that initial burst of joy is often deflated by the realization that you need a lot of little things when you move to a new place. For many people, that means an expensive shopping spree. Instead, consider making your first stop the local secondhand store. Many of the items you need to set up an apartment or a home for the first time or in a new area can be found at a thrift shop, which means you’ll cut back on that big burst of spending that can really hurt your wallet. Here are nine items to consider purchasing secondhand for your new place. Silverware is a requirement for eating food at home without making a complete mess. Fortunately, most secondhand stores have a selection of silverware on hand. You might not have perfect matching silverware, but you’ll have more than enough for your needs at an inexpensive price. Dishes are also a dining necessity. Again, it’s easy to find plenty of plates and bowls at a secondhand store for a pittance, though you may not find a matching set. Still, you’re far better off buying two or three partial sets for pennies than shelling out the money for a single matching set from a store. Glasses and cups for consuming beverages are another household essential that’s perfect for a secondhand purchase. As with silverware and dishes, you’ll likely not find a matching set, but what you will find are many cups and glasses to fill your cupboards at an inexpensive price. A toaster or toaster oven both perform the task of toasting bread, bagels, English muffins and other such items. A toaster oven goes further, making it easy to make grilled sandwiches and cook small items. Both can easily be found at secondhand stores in working order and can make for a valuable addition to your kitchen to help you with food preparation. Lamps are simple items that are often found in abundance at secondhand stores. All varieties of lamps, from desk lamps and floor lamps to clip lamps and table lamps, can usually be found secondhand at a very reasonable price. A dining table is an essential piece of furniture in most houses or apartments, as it provides a place to eat and share meals. You can find simple dining tables at secondhand stores, and they often come with simple, solid chairs. The key thing to remember is you can buy an inexpensive starter set, and then upgrade later when you have money to easily do so. A side table is often a key part of a living room, providing a place to put a beverage, snack plate or remote controls as you watch TV, study or read a book. Side tables can be incredibly inexpensive. It’s easy to find one secondhand for well under $10. A bed frame is a key piece of furniture for those who have moved beyond the “mattress on the floor” style of bedroom décor. Bed frames can be expensive if you purchase them at a furniture store, but there are often many varieties of metal and wooden bed frames you can find at secondhand stores if you shop around. It’s important to remember that bed frames are purely functional items meant to be covered with a mattress and other decorative materials, so don’t worry about beauty. Décor might seem like an unusual item to buy secondhand, but it’s easy to find things such as picture frames and wall hangings in secondhand stores, particularly in more upscale neighborhoods. If you’re creative, you can find a variety of décor items at a very nice discount. One final suggestion: Don’t buy certain types of furniture used unless it comes from a trusted source. Used furniture can be a source of bedbugs or other unwanted travelers that you simply don’t want in your home. Solid wood items are fine, but be wary of upholstered used furniture and used mattresses. The thing to always remember when buying secondhand items is that they’re replaceable as time goes on. They can serve you for a long time if needed, but they simply provide an inexpensive and functional solution that can significantly trim the costs of setting up a new home. 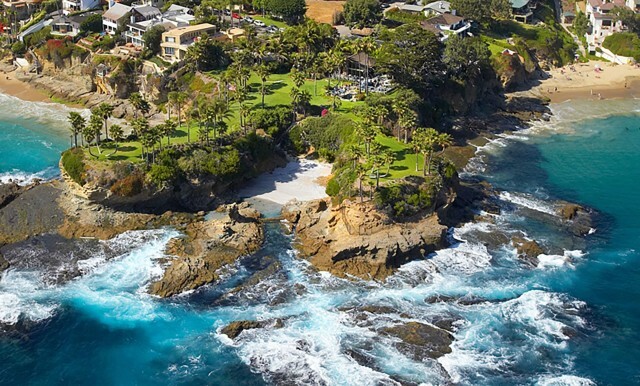 ZillowThis property in the coastal California town of Laguna Beach is on the market for $75 million. 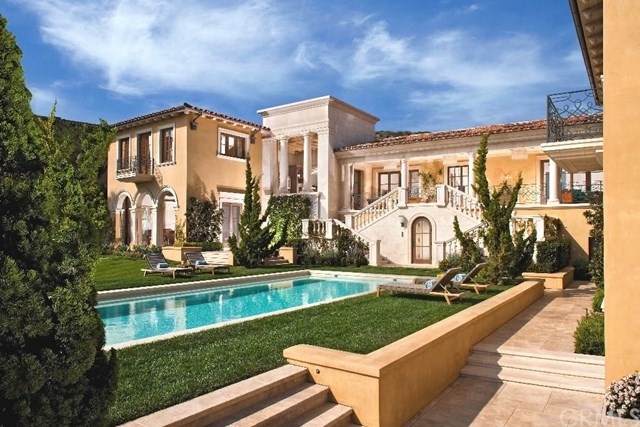 Can you tell the difference between a $72 million mansion and a $149 million estate in Beverly Hills? When you get into the eight-figure and nine-figure price range, it’s the little things like 70-year-old imported olive trees and parking for 66 cars that set listings apart. 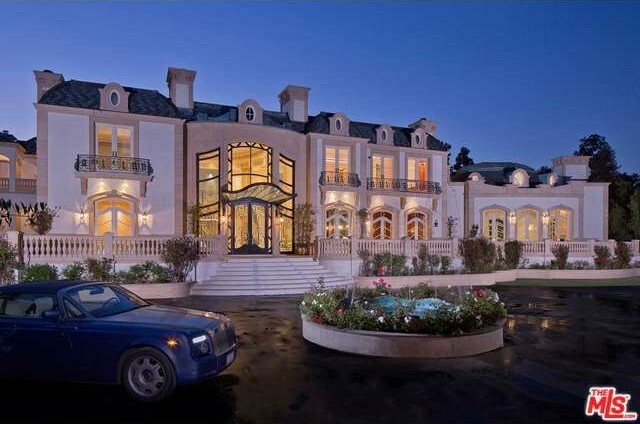 See for yourself with a look at the West’s most expensive homes on Zillow. 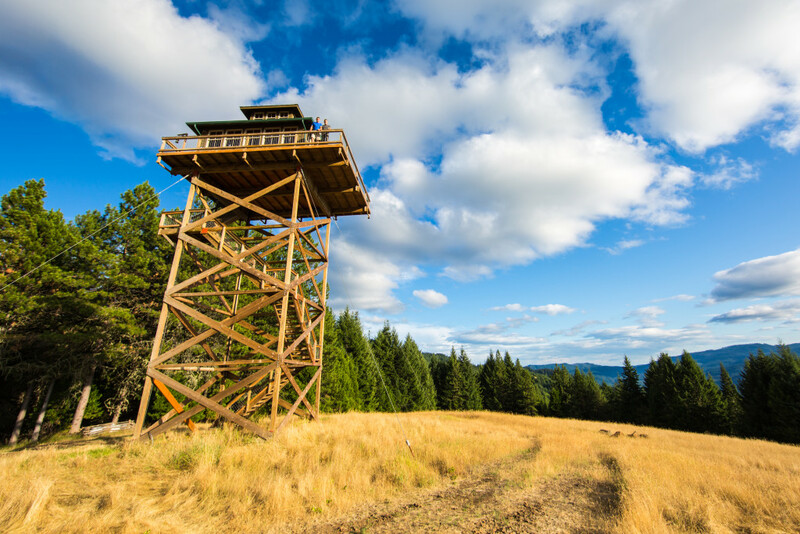 While you won’t find pocket listings, working ranches or empty lots on this list, you will find 13 publicly listed estates ripe for perusing. When Palazzo di Amore hit the market last November, it claimed the title of America’s most expensive listing. (It has been reduced from $195 million.) At the time, owner Jeff Greene said, “this property is an incomparable crown jewel without an equal.” With a Turkish-style spa, 70-year-old imported olive trees and massive wine cellar, it’s easy to see why. The home is listed with Joyce Rey and Stacy Gottula of Coldwell Banker Previews International. Rancho San Carlos has been owned by the same family for nearly a century, so the fact that it’s up for sale is a big deal. The property includes a main residence with more than 30 rooms, extensive equestrian facilities and 10 additional guest cottages. Harry Kolb of Sotheby’s International Realty holds the listing. 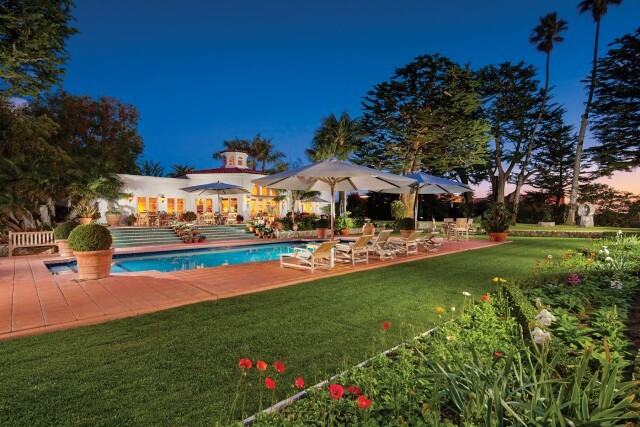 See more Montecito homes for sale. No cattle here, but Shakespeare Ranch is big enough to house your extended family and all your friends. 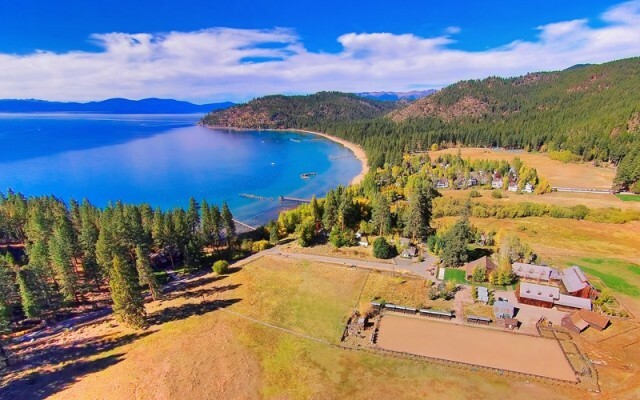 The 133-acre lakefront property has a total of 30 cabins and outbuildings with clever Shakespearean names like “To Be,” “Or Not to Be” and “Twelfth Night.” Lexi Cerretti and Claudia Thompson of Sierra Sotheby’s International Realty held the listing for the property, which is now off the market. 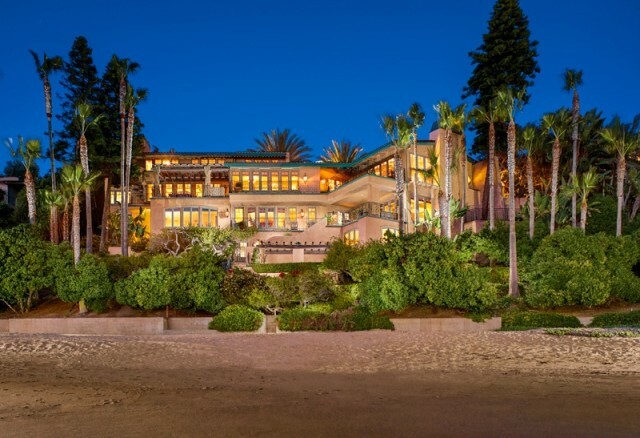 When Richard Nixon bought this home in 1969, it became known as “The Western White House.” The president hosted 17 heads of state and wrote memoirs at the oceanfront property, which is located on one of Southern California’s most scenic sections of coastal residential real estate. Rob Giem of Sotheby’s International Realty is the listing agent. See more homes listed in San Clemente. Also listed by Rob Giem, Twin Points consists of two peninsulas where you can watch the waves crash between Laguna Beach’s Crescent Bay and Shaws Cove. The property has been in the same family since 1930 but was rebuilt in the late ’60s and has been added to over the years, The Wall Street Journal reports. 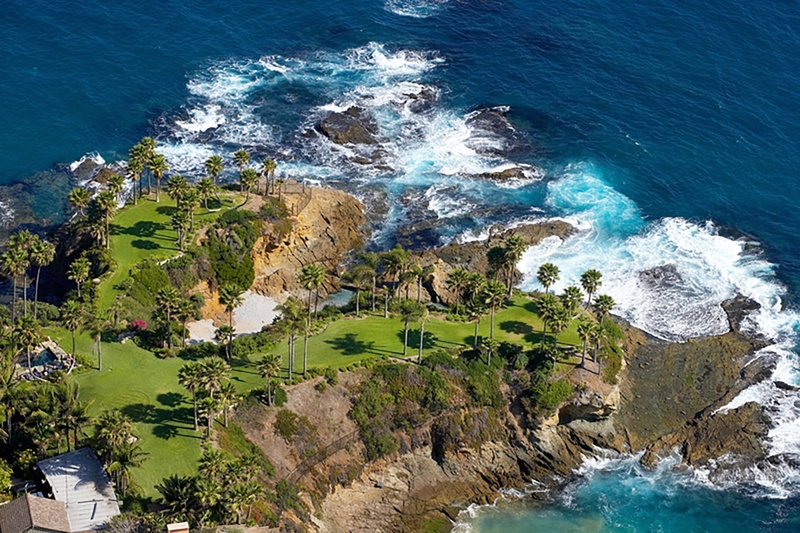 See more Laguna Beach listings. Spanning more than 1.5 acres on one of the most coveted streets in Beverly Hills, this property was designed for some serious entertaining. The home, which could pass as a life-size Barbie dream house, has everything from a dance floor and cocktail bar to parking for 66 cars, Forbes reports. Jade Mills of Coldwell Banker Previews holds the listing. See more homes listed in Beverly Hills. Dating to 1938, this Georgian traditional was completely renovated over more than five years. 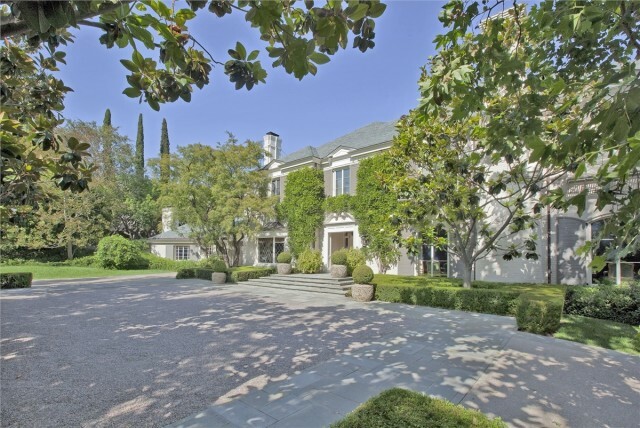 In addition to the main residence, the Holmby Hills estate includes a guesthouse, pool, private guest suite, lighted tennis court and nearly two acres of rolling lawns and gardens. The home is listed with Loren Judd of Coldwell Banker. See more Beverly Glen homes for sale. No detail has been overlooked in this Laguna Beach gem, which was completed in 2010. The interior boasts ocean-facing loggias, terrazzo floors inspired by the Getty Villa museum, fountains imported from Europe, century-old olive trees and more. Rod Daley of Coldwell Banker holds the listing. With an 18,000-square-foot home on 876 acres in the Rocky Mountains, Four Peaks Ranch is as big as it looks. Outside, the property boasts 15 miles of trails, a private beach, three ponds, two fireplaces, four fire pits, two full kitchens and a brick pizza oven. Inside, the house has seven bedrooms, 11 baths, open living spaces and a glass elevator. Joshua Saslove of Douglas Elliman Real Estate is the listing agent. 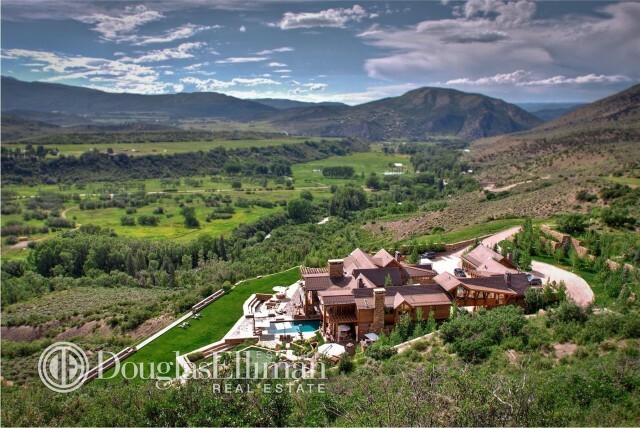 See more Snowmass Village listings. This early 20th-century craftsman has had only three owners. The estate, boasting beautiful period details, spans 6.14 acres in Highland Park. Allie Beth Allman of Allie Beth Allman & Associates holds the listing. 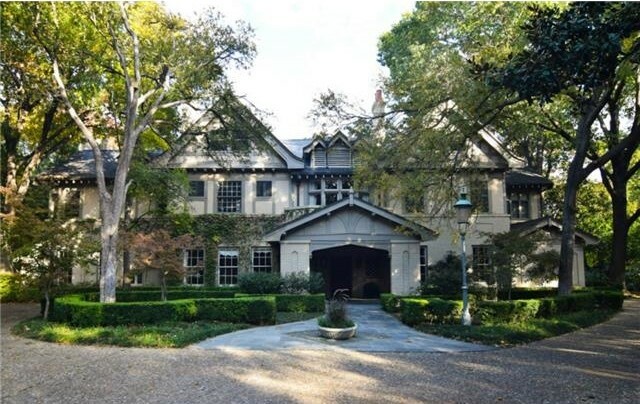 See more Highland Park listings. Rolling Hills reportedly has a rule that homes in the prestigious community only span one floor, but this is no single-story rambler. 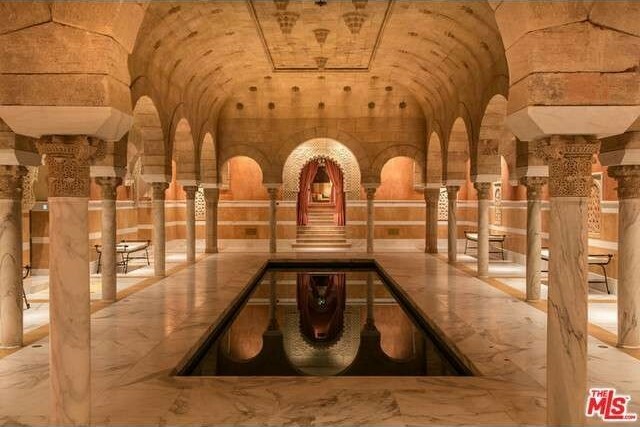 Built five floors down, the 5,000-square-foot mansion has everything from a Moroccan-style bath to a full-size tennis court underground. The unique property is listed with Marcie Hartley of Hilton & Hyland. See more Rolling Hills homes for sale. 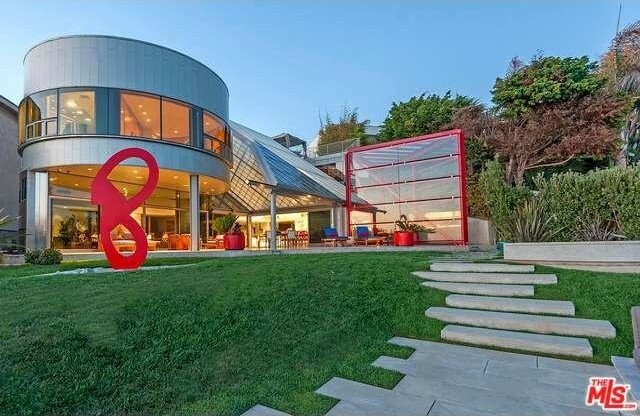 Located on a prime piece of Malibu oceanfront, this home was designed by famed architect Ed Niles. The modern design was inspired by a translucent shoji door, and several feng shui elements line the property. It’s also very high-tech with a music room, soundproof home theater, elevator and 19-server hosting capability. The Agency‘s Ari Afshar is the listing agent. See more Malibu homes on the market. Located on Laguna Beach’s private Irvine Cove, this Mediterranean Revival boasts 180 feet of beachfront, as well as sun-soaked terraces and mature gardens. With nearly 10,000 square feet of interior space, the great room alone is 1,000 square feet with three vantage points for taking in the view. 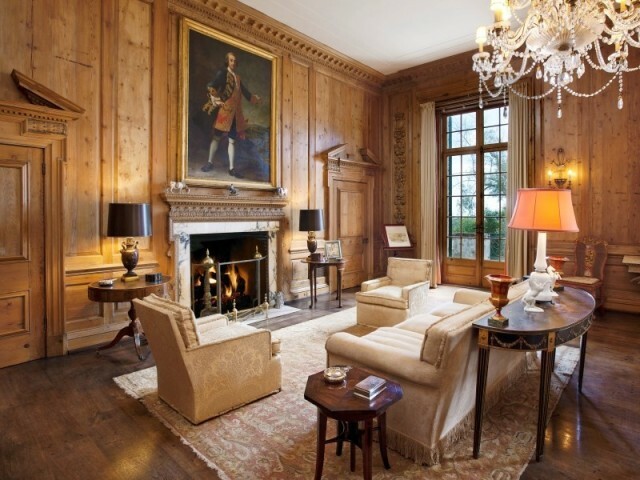 The home is being marketed by Sotheby’s Rob Giem, who holds two other listings on this list. See more Laguna Beach homes for sale. Zillow via Credit.comOne of these homes was listed for $139 million, and the other for a mere $13.9 million. Can you tell which is which? Perusing homes out of one’s price range online may as well be a national pastime in America. Who doesn’t love imagining what it would be like to live someplace palatial, or even just gawk at these monster homes and their even bigger price tags? In the world of real estate, however, there’s expensive and then there’s insanely expensive. The Credit.com team decided to take a look at two homes for this article, one of which is way out of our price range, the other of which is way, way, way, way, waaaaaaaaaay out of our price range. 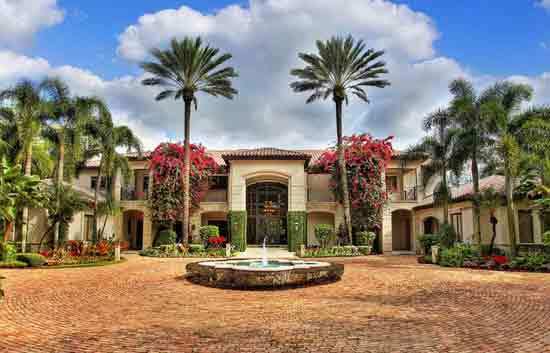 The former is a seven-bedroom, nine-bath Florida home in Coral Gables, selling for $13.9 million. The latter is an 11-bedroom, 17-bath house, just up the road in Hillsboro Beach. The Hillsboro mansion was on the market for a mere $139 million before the listing was removed — perhaps indicating a sale, or perhaps a change of heart by the seller. We wanted to see what the real difference is between the two places. Is the Hillsboro Beach place really 10 times the house? How could one even arrive at that price? Who are we kidding? We really just wanted to look at the pretty pictures. According to the listing on Zillow, here are the basics for the $13.9 million property in Coral Gables. Price per square foot: $1,104. Parking: attached garage, four spaces. “A foyer with a grand chandelier and 28-foot ceilings opens to a formal living room with 30-foot tall ceilings…. “While the canal does not support a large vessel, the estate comes with a deeded boat slip allowing up to a 60-foot yacht. “Across the hall from the library lounge is a home cinema…. “Take the elevator or the stairs to the second floor where a split plan finds the master suite set away from the other bedrooms. So What Could $139 Million Get You? 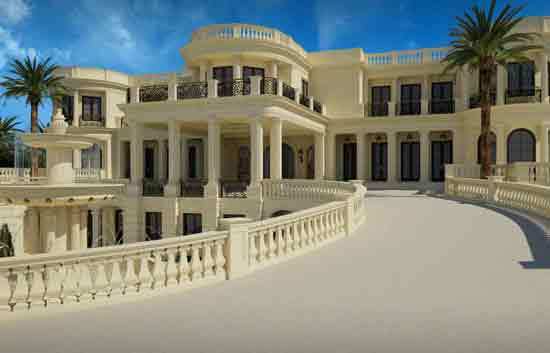 For those of you with $139 million burning a hole in your pocket, here are the basics of the Hillsboro Beach property also known as “Le Palais Royal” that recently was pulled from the market. The listing is courtesy of Zillow. Price per square foot: $3,327. Parking: attached garage, 30 spaces. And here are some excerpts from the description of the house featured on Le Palais Royal’s dedicated website. “On one side of your very own private 465 [feet] of Atlantic beachfront and on the other side be romanced at the view of your yacht docked on 492 feet on the [Atlantic Intracoastal Waterway]…. “Custom designed doors…with 22-karat gold leafing, opening beneath the grand [staircase]… taking craftsmen more than two years to realize with an investment of $2 Million…. “The first-ever IMAX Theater contracted for private use… seating 18 along with a complete bar and IMAX lounge giving guests a unique experience…. “A 4,500-sq. ft. infinity edge La Piscine with a 12-ft cascading waterfall, a double-loop, LED-lit waterslide which plunges into the pool…. “An outdoor Jacuzzi is positioned above the waterfall allowing complete panoramic sea views…. So which one will you take? But don’t shelve your dream just yet. It’s possible to get a luxurious look for under $50,000, which is close to the average price spent on a budget kitchen remodel. We asked designers where they’d splurge, where they’d save, and other projects to consider for a space worthy of your culinary creations. Before you start, carefully consider the space and your lifestyle. She ranks the overall layout as the most important element in a kitchen renovation. “Good design is good design. A proper prep center, cooking, and cleanup [space] is essential.” So before you get carried away on Pinterest, think more about the layout that best suits your daily habits rather than, say, Gwyneth Paltrow’s. Where to Splurge on Your Kitchen Remodel? Obvious as it may be, quality appliances are key to the gourmet kitchen. Kraiem likes side-by-side refrigerator and freezer models that offer custom panel options, which can blend in with your cabinets for a seamless look. A high-end dishwasher is also a luxury worth looking into, especially if it also offers the custom panel option. Hoods can be customized to suit the overall design. 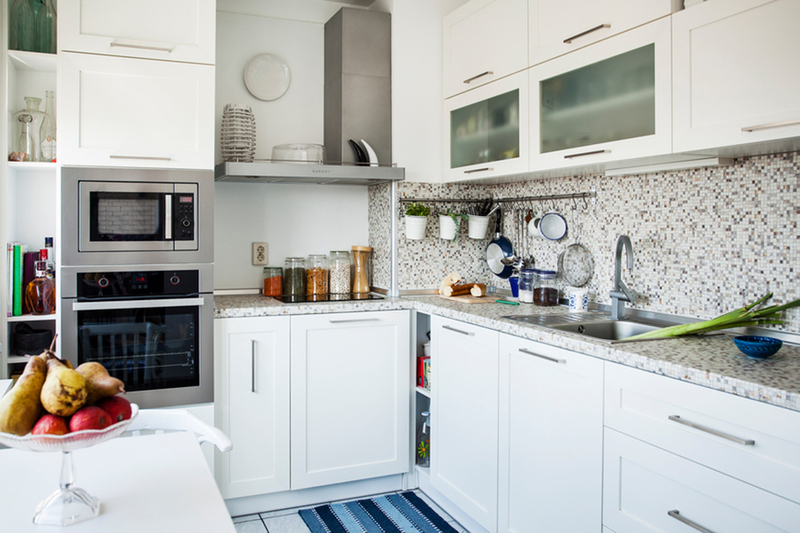 Clutter can cramp the style of even the fanciest kitchen. However, you’ll want to go for storage options that suit your kitchen. She also says that shallow-depth base cabinetry (13 to 18 inches deep) is especially cost-effective and can fit most people’s storage needs. Where to Save on Your Kitchen Remodel? Additionally, new designs in porcelain present another cost-effective yet stylish option for counters, floors, and other surfaces. Since a backsplash tends to cover a smaller space, it’s easier to cut costs here. “I tend to like to use the same countertop and backsplash material for a modern look. In this case, quartz is great because it doesn’t stain or get damaged easily,” Kraiem says. “I also like to use frosted glass or stainless steel for a unique look that’s not so expensive.” For more traditional kitchens, a tile or mosaic backsplash is the most budget-friendly option. Your flooring is a big element of your kitchen, so it can have a big impact on overall style. “For example, with floors, 24-by-24- or 24-by-48 porcelain tiles in a concrete or minimalist color will ‘speak’ to those who walk on them as highly sophisticated,” Brannock says. “Another option is wide and random-width hardwood flooring such as fumed white oak for a rustic yet timeless elegance.” But the square footage here is probably less than in other areas in your home, so it’ll be less costly than, say, redoing the floors in the living room. While these smaller elements play an important part in the function of your kitchen, they aren’t as noticeable, meaning you can get away with budget-friendly options. “Focus on the look and quality without splurging,” Kraiem says. *Costs for this report were estimated by designer Natalie Kraiem and are based on a 10-by-10 kitchen. Your costs may vary depending on individual design choices. While short-term home rental sites such as Airbnb and HomeAway have made finding and listing vacation properties and alternative lodging fast, easy and convenient both for hosts and guests, there are risks involved for both parties. Here are a few ways to mitigate those risks, whether you’re renting a vacation villa or making some extra cash by welcoming paying guests into your home. Reputable sites not only supply the largest number of rental offerings, but will additionally provide you with some peace of mind because they offer basic security features. Beyond conducting background and address checks, these sites also certify hosts with a proven track record, host community discussions, post uncensored reviews and ban questionable parties. As a guest, all you have to go on are photos (which may not be verified) and reviews. If a place does not have more than three positive reviews, think twice about staying there. 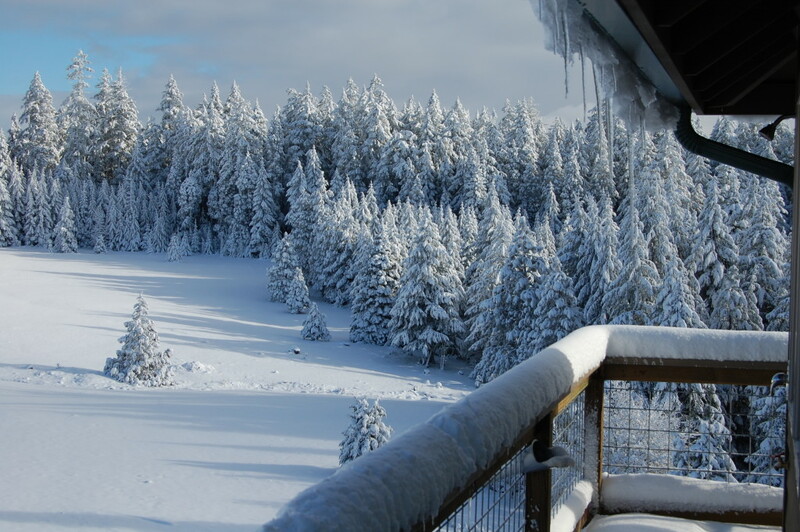 In most cases, conversations between hosts and guests happen through the vacation rental website’s messaging system, but if having a phone conversation is an option, go for it. It’s a great way to size each other up, and is extremely important if you’re doing a home swap, as these exchanges require an enormous amount of trust from both parties. During the call, note whether the host sounds legitimate and the house they describe matches what’s online. If you’re talking to a potential guest, consider whether they ask questions a visitor would typically have. Also pay attention to the types of answers you’re getting. For example, if you’re a guest and you want to know whether the host has the legal right to rent the apartment to you, listen carefully to their answer. If they seem to be hedging at all, or even seem to be offended by the line of questioning, consider looking elsewhere. If everything feels “right,” however, go ahead with the transaction, keeping in mind that while it’s still possible to be scammed over the phone, it’s usually easier to fool someone when the communication takes place online. DON’T: Pay with cash or money order. Out of all the payment options, credit cards offer the most protection against fraud or wrongful charges. Online money transfer services such as PayPal may also be an option, and can be a good way to go. A personal check may also be fine. But never pay with cash or money order, since those are the easiest means for the unscrupulous to disappear with your money. Is the host insisting on this type of payment? Rushing you to make a wire transfer? Don’t go there. If cash is required for a cleaning fee or damage deposit, guests should play it safe by postponing this last round of payments until they reach their destination. And get a receipt for the sum rendered. Many problems can and do arise. Guests may not show up. Properties may be misrepresented, unsanitary, already occupied, or full of safety hazards like exposed wiring or loose stairs. Protection policies may not exist, and if they don’t, or if they’re minimal, you might very well be on your own if something doesn’t work out. There is no government or trade agency regulating the advertising of rentals, so proceed with caution. Note: The views and opinions expressed in this article are those of the author and do not necessarily reflect the opinion or position of Zillow or AOL Real Estate.